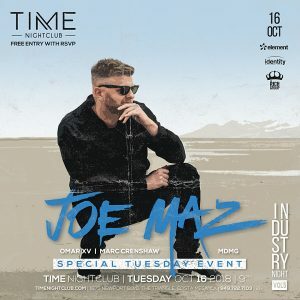 The name Joe Maz is known throughout clubs & DJs all around the world. After receiving the Promo Only Remixer of the Year award in 2017 from non other than Nile Rodgers…Joe’s trajectory has skyrocketed. Joe Maz has now been credited with official remixes for Adele, Coldplay, Beyonce, Kanye West & Major Lazer… and has also reached the top 20 Billboard Dance Chart with his own single “No Good”. He rose to popularity after having worked with Danny Daze and Gigamesh under the monikers of DiscoTech & Señor Stereo. This soon got the attention of the legendary DJ AM, who asked Joe & his group DiscoTech to join his agency in 2008 along with Steve Aoki, & Jazzy Jeff. Joe’s music has since gained the support of Skrillex, Diplo, Tiesto, Don Diablo, The Chainsmokers and many more. His music has also received massive radio support through the entire world, including on Diplo & Friends, Tiesto’s Club Life, Ryan Seacrest (LA) & Hollywood Hamilton’s (NYC) shows, Annie Mac’s BBC Radio 1, Pete Tong, BPM Sirius/XM, and everywhere in between. In 2016, he joined the prestigious Billboard panel as a reporting member.